For this spread, I preserved the image on the left side of the page by framing it with washi tape. I used a stencil with blending tool and Distress Ink to apply the polka dot pattern to the background, and added washi tape on the right edge of the page. The column of birds were die cut onto black paper. 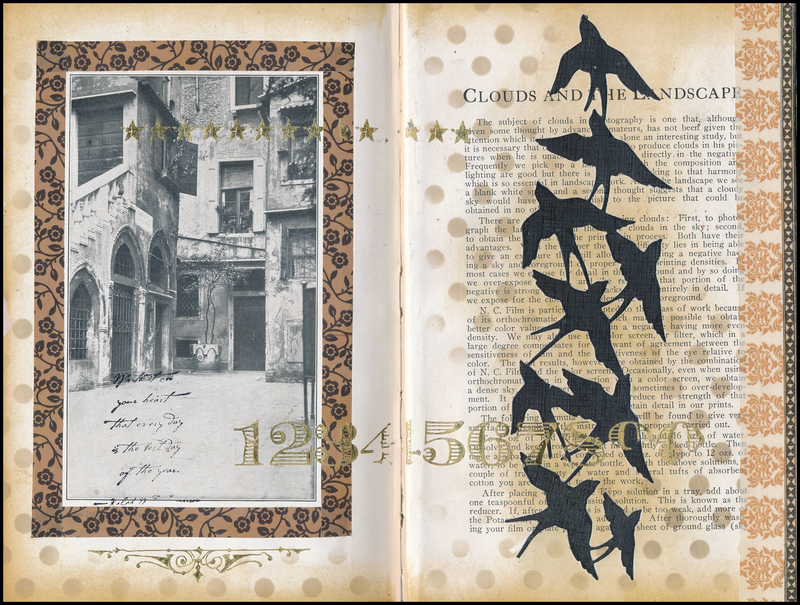 The gold rubons (stars, numbers, and scroll below the left picture) were from a Tim Holtz collection and visually tied the two pages together. I rubber stamped some black handwriting onto the left image for variety. One of the reasons I enjoy art journaling in old books is that the original text and page titles often show through on my finished pages. It was appropriate that “Clouds and the Landscape” was the title on a page that features birds flying upward.